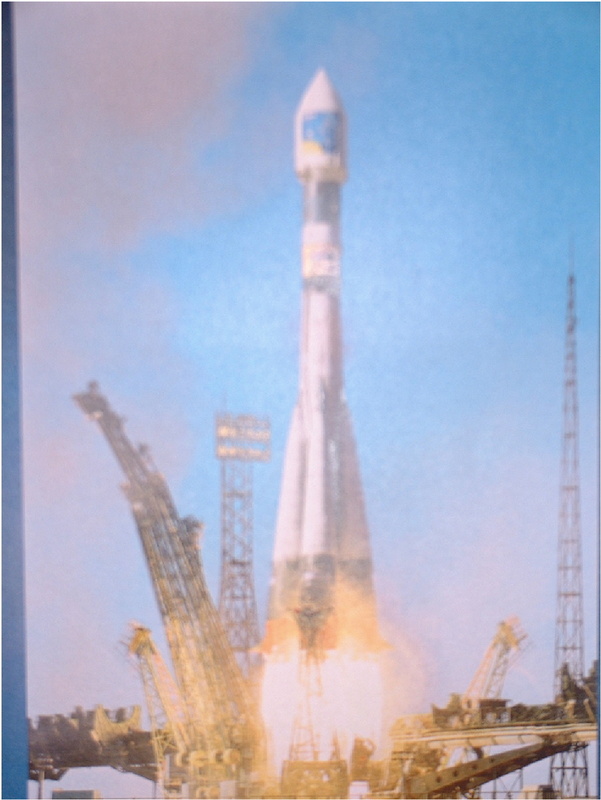 "Launch of the Soyuz at Baikonur"
President Tetsuo MACHII, Mobile Broadcasting Corp. Mobile Broadcasting Corp (MBC) is one of Japanese new satellite-service company. President & CEO of MBC, Mr. Tetsuo Machii, was interviewed at it's headquarter in Ginza. What are MBC's services and how is the preparation status of the services? Dr. Burton I. Edelson, Director of the Institute for Applied Space Research, The George Washington University, passed away on January 6, 2002 and was 75 years old. He was very active as one of steering committee members in the U.S. for the JUSTSAP (Japan-U.S. Science, Technology and Space Applications Program). I pray for the repose of his soul. "History of Space Development from Slightly Different View"
New Series by Mr. Y. Kazekami, Senior Editor. Subtitle is "History of Space Development from Slightly Different View". He will discuss about the history of Space Development from 1962 to now, when James Bond series have been picturized, through the screen. Some people anxious about whether he can make a valuable comment for readers. Ms. Takenoshita found a precious key word "SPACE" when she actually saw Robot-Arm and Artificial-Brain during her activity to find a job. She is now accomplishing her goal, i.e. to continue a job for a long time, while she looks so busy to raise her children as a mother. "Attending AIAA Technical Committee on Communications System"
A meeting of AIAA TCCS was held at the Reno Hilton Hotel, Reno, Nevada on January 14, 2002. Dr. Ron Smith, TRW is Chair of the TCCS. 5 TCCS member, Group Director and Deputy Group Director of Technical Activity Committee attended there. Also 9 TCCS member attended using telephone. I attended as a committee member with Dr. Takashi Iida, President of CRL to the activity of JFSC and the preparation of ICSSC-21. "Attending AIAA International Activities Committee Meeting"
A meeting of AIAA-IAC was held at the Reno Hilton Hotel, Reno, Nevada on January 17, 2002. Dr. Brian D. Dailey, Senior Vice President, Lockheed Martin Corp. is Chair of the IAC. 24 people attended there. I attended as a committee member, and Mr. Yutaka Kazekami, Director of MELCO attended to report the present status of Japanese preparation related to the WSC (World Space Congress).